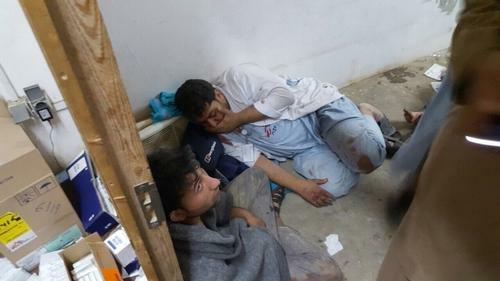 Quote; "One month ago, on Saturday 3 October 2015, the MSF Trauma centre in Kunduz was hit several times during sustained bombing by coalition forces, and was very badly damaged. The total number of dead is known to be at least 30, including: 10 known patients, 13 known staff, and 7 unrecognisable bodies that were in the wreck of the hospital and that have not been identified so far. These unfortunately may not be final numbers. On this one month anniversary of the attack on our colleagues and patients, we wish to express our deep concern for each wounded and severely sick person in Kunduz that has not had access to trauma care in the last month. We also request that the protections of health staff, health structures and patients in conflicts, granted by International Humanitarian Law, be respected. The possibility to receive impartial medical care by victims of wars depends on it. From the grounds of the bombed hospital, the MSF staff in Kunduz send their deep appreciation to everyone around the world who stood in solidarity with them. Three weeks after the event this is the first time they see each other again. MSF has been informed that the International Humanitarian Fact-Finding Commission (IHFFC) has been activated. Despite receiving an apology from President Obama, we reiterate our ask that the US government consent to an independent investigation led by the IHFFC to establish what happened in Kunduz, how it happened, and why it happened. MSF is pushing for a full, transparent, and independent investigation into this shocking event. Help us by adding your name to the growing petition at Change.org, asking U.S. President Obama to consent to an independent investigation. Enough. Even war has rules. 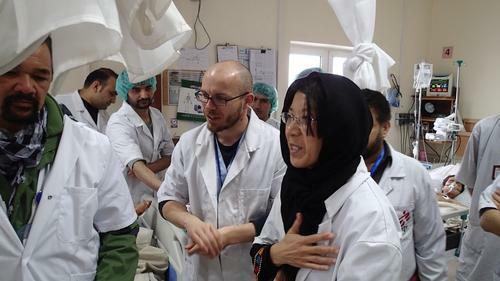 Kim Clausen/MSF Dr. Joanne Liu, President of MSF International, while visiting Kunduz Trauma Center, Afghanistan, February 2015. "Today we pay tribute to those who died in this abhorrent attack. And we pay tribute to those MSF staff who, while watching their colleagues die and with their hospital still on fire, carried on treating the wounded. This was not just an attack on our hospital - it was an attack on the Geneva Conventions. This cannot be tolerated. These Conventions govern the rules of war and were established to protect civilians in conflicts – including patients, medical workers and facilities. They bring some humanity into what is otherwise an inhumane situation." "We are seeking an investigation into the Kunduz attack by the International Humanitarian Fact-Finding Commission. This Commission was established in the Additional Protocols of the Geneva Conventions and is the only permanent body set up specifically to investigate violations of international humanitarian law." Read the full speech. 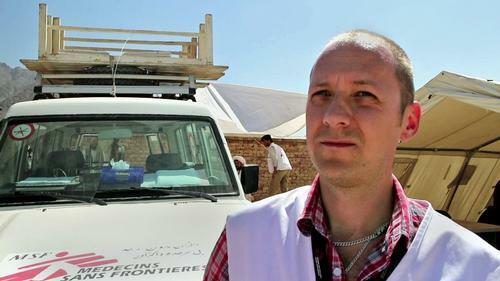 Lajos Zoltan Jecs, MSF nurse, photo taken in September 2013, Afghanistan. MSF nurse Lajos Zoltan Jecs was in Kunduz trauma hospital when the facility was struck. "There are no words for how terrible it was. In the Intensive Care Unit six patients were burning in their beds. We looked for some staff that were supposed to be in the operating theatre. It was awful. A patient there on the operating table, dead, in the middle of the destruction. We couldn't find our staff." Read his full account. Not a single member of our staff reported any fighting inside the MSF hospital compound prior to the US airstrike on Saturday morning. The hospital was full of MSF staff, patients and their caretakers. We reiterate that the main hospital building, where medical personnel were caring for patients, was repeatedly and very precisely hit during each aerial raid, while the rest of the compound was left mostly untouched. We condemn this attack, which constitutes a grave violation of International Humanitarian Law.” – Christopher Stokes, General Director, Médecins Sans Frontières. Surgery activities in one of the remaining parts of MSF's hospital in Kunduz. In the aftermath of the bombings on the 3rd October 2015. "Under International Humanitarian Law hospitals in conflict zones are protected spaces. Until proven otherwise, the events of last Saturday amount to an inexcusable violation of this law. We are working on the presumption of a war crime." – Dr Joanne Liu, President, MSF International. Read complete statement. "The US government has admitted that it was their airstrike that hit our hospital in Kunduz and killed 22 patients and MSF staff. Their description of the attack keeps changing – from collateral damage, to a tragic incident, to now attempting to pass responsibility to the Afghanistan government. The reality is the US dropped those bombs. 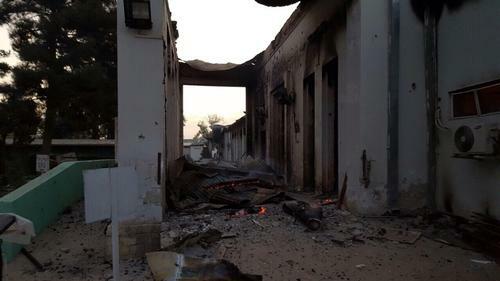 The US hit a huge hospital full of wounded patients and MSF staff. The US military remains responsible for the targets it hits, even though it is part of a coalition. We had informed all fighting parties of hospital GPS coordinates. All parties to the conflict, including in Kabul and Washington, were clearly informed of the precise location (GPS Coordinates) of the MSF facilities – hospital, guest-house, office and an outreach stabilization unit in Chardara (to the north-west of Kunduz). As MSF does in all conflict contexts, these precise locations were communicated to all parties on multiple occasions over the past months, including most recently on 29 September. 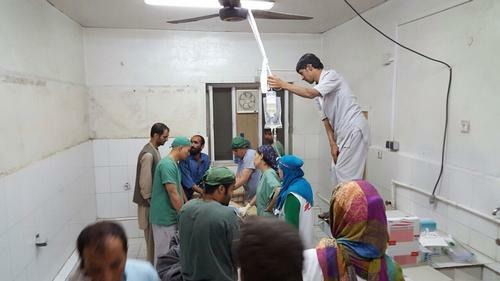 "MSF is disgusted by the recent statements coming from some Afghanistan government authorities justifying the attack on its hospital in Kunduz. These statements imply that Afghan and US forces working together decided to raze to the ground a fully functioning hospital – with more than 180 staff and patients inside – because they claim that members of the Taliban were present. This amounts to an admission of a war crime. This utterly contradicts the initial attempts of the US government to minimise the attack as 'collateral damage'. There can be no justification for this abhorrent attack on our hospital that resulted in the deaths of MSF staff as they worked and patients as they lay in their beds. A destroyed area of the MSF hospital in Kunduz, Afghanistan is visible at first light on 03 October 2015, the morning after the facility was hit by sustained bombing. The MSF hospital in Kunduz is currently not operating, following the sustained bombing early Saturday morning. All international MSF staff members that were in Kunduz have been evacuated. All critical patients were referred to other health facilities. The MSF Afghan staff who were not killed are either being treated in health facilities in the region or have left the hospital. On Saturday, some staff assisted to provide healthcare in other non-MSF facilities in the region, and others have joined their families at this difficult time. No medical activities are possible now in the MSF hospital in Kunduz, at a time when the medical needs are immense. It is painful for MSF to withdraw at a time when the medical needs are so acute, but in the aftermath of being bombed, it is too early to know if it would be safe to continue running medical activities. MSF works hard in conflict areas, as had been the case in Kunduz, to ensure all fighting parties respect the sanctity of medical facilities. At the moment, MSF has not received any explanations or assurances that give us the confidence to be able to return. This is why the organisation is demanding a full, independent and transparent investigation of what happened, and why. Without that information, there are too many unknowns to allow a return in the immediate future. MSF is committed to the people in Kunduz and will explore, as soon as key questions are answered, options to return with medical services in the Kunduz region. MSF continues to run four other health facilities in Afghanistan. This is the first step needed to undertake an independent investigation into the attack on MSF’s hospital in Kunduz, Afghanistan, on 3 October. The IHFFC is now awaiting the agreement of the United States and Afghanistan governments to proceed.